In September of 2003, smile cards began appearing all around the world. They are markers of a newfangled game of tag, where you're it because someone has done something nice for you. Then it's your turn to do something nice for someone else and, in the process, pass the card along. 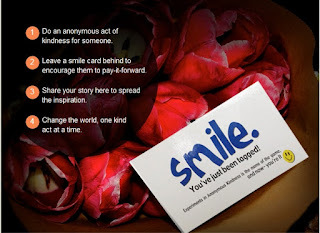 This is a game of pay-it-forward: anonymously make someone smile, leave behind a card asking them to keep the ripple going. It's easy and fun. Is kindness truly contagious? Join in the fun! Get your smile cards, read up on some kindness ideas, and get started! Lots of free printable designs available! Also available in Spanish, French, German, Italian, Hindi, Chinese, Tamil, Gujarati, Greek, Japanese, Hebrew, Portuguese, Romanian, and Arabic. It says to take 'em to your local printer to copy , but I think the site was put up before the days were many of us have our own printers. You can also print them yourself.